“Our little church decided to have a Christmas program at the last minute and I’ve only got two practices with the children. 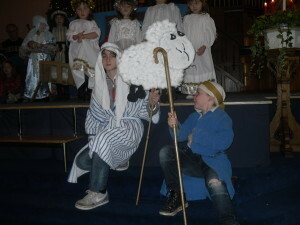 Perfect for a pre-school, primary school or church nativity play…. The script can be narrated with or without actors (but needs Mary and Joseph), with a choice of the actors speaking or the narrator saying their lines. Even the instructions to the actors are said in rhyme as part of the script, so NO REHEARSAL is required. Written entirely in rhyme (a proven way to make it easier to remember), the script lasts 15 to 20 minutes (excluding any music you choose to add). No music is included so that you can use your own familiar songs, or include carols instead. The script lasts 15 to 20 minutes, plus any music you might choose to include, and telling the traditional bible based nativity story entirely in rhyme using narration and small optional speaking parts, with obvious prompts making rehearsals a luxury, not a necessity. Narration interspersed with obvious prompts for…. 19 (optional) short, rhyming speaking parts (averaging 2 to 4 lines) to make everyone feel special. The speaking parts all include obvious prompts such as “The innkeeper said….” and printable prompt cards (and ‘name tags’ if required) are included with the script. Every detail has been considered to minimise your workload. Illness and absence (and even stage fright) is easily accommodated, as the narrator can simply continue with an actor’s lines as part of the story. I have even written two choices of message at the end so that you can choose the most appropriate for your production. Option A is a biblical message, and Option B is a general ‘goodwill’ message. If you’re ready to buy the Simplest Nativity Play Ever click on the ADD TO CART button below, or continue reading if you need more details. An instructor (gives rhyming instructions to the cast) Alternatively, the narrators could do this. An optional extra cast of up to 17 who may choose to mime or have their own lines, plus dancing angels and child extras. This script can include as many actors as you choose without altering the script length, as the narrator says lines that actors omit. It is suitable for any age cast and ability, although the narrators must be confident readers. It therefore lends itself perfectly to a mixed age cast, and mixed abilities, and even to an unrehearsed community performance of volunteers! No songs are included but popular hymns/ carols are suggested for everyone to sing together rather than the children performing as part of the play. Alternatively, use the children’s past favourite songs to keep things simple. If you really do want some simple songs, look at my other scripts too (listed at the top right of the page or scroll to the bottom of the page) as all of my songs will work with different scripts. Allow around 15 to 20 minutes for the words of the script. If you include the “Simplest Nativity Play Ever Roll Call Poem” allow appromately 2 minutes. With good, confident narrators and an instructor, there is no need for a full rehearsal, as the instructions on what to do are given to the actors in rhyme by the instructor as part of the script, but if you have the opportunity to rehearse, the play will of course have a more professional overall effect. Some familiarity with the script ahead of time will, regardless, be necessary as far as the narrators and instructor are concerned, but otherwise there will be no need for a rehearsal AS LONG AS EVERYONE WHO IS PARTICIPATING LISTENS CAREFULLY THROUGHOUT! Traditional costumes are all that is required for each actor THAT YOU CHOOSE TO INCLUDE. Remember, however, that this script can be used to DELIBERATELY give the effect of a spontaneous, unrehearsed, community event, in which case costumes can be omitted or very basic. If you do choose to use them, these are potentially the costumes you will want…..
Mary, Joseph, 2 Soldiers, 3 innkeepers, 3 Bethlehem residents, Host of angels and Angel Gabriel, 4 shepherds, 3 kings, King Herod. 2 narrators and an instructor, who could be dressed in everyday clothes, unless you choose to give them a specific outfit. Just £9.95 for an instantly downloadable, customizable word document of the script, with an additional pdf copy, plus all of the printable script prompts for the script as it is written. Finally, a name tag for every character included in the script is provided ready to print off on card to make the organisation/direction/costume allocation easier. I pride myself in making my scripts the best value for money around, so my SIMPLEST NATIVITY PLAY EVER can be downloaded instantly to your computer (as a word document) for the special low price of just £9.95. An easy to follow script, with….. Printable soldier’s scroll and prompt cards for the cast. Which is yours to customise as you choose once you have bought it, so that you can…….. The pdf version is also included for your convenience. A “Simplest Nativity Play Ever Roll Call” performance poem: a fabulous and unique finale for your nativity play. Again, all in rhyme, this gives everyone involved the opportunity to stand (and maybe take a bow), again without rehearsal required, as they are mentioned individually. This idea has been so well received that it has become my trademark and I now write one for every script. 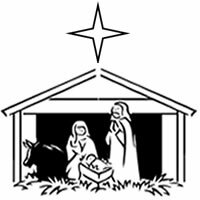 “The Unending Christmas Story”: A purpose written rhyming Christmas shape poem which can, if you choose, be read out to round up the message, at the end of your nativity play. 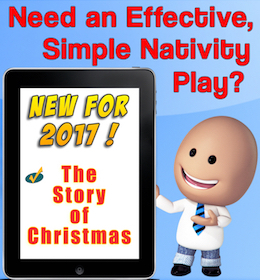 Grab your LICENCE FREE COPY of the Simplest Nativity Play Ever script at the ……. Used this script before and want an alternative? ……. with all of the script prompt cards pre-prepared for you, and simple and flexible enough to do without rehearsal if necessary, but with lines for anyone who wants to say them? Want lots of options on how to use it to make it perfect for your unique circumstances? Still not sure? Want all of the music included? 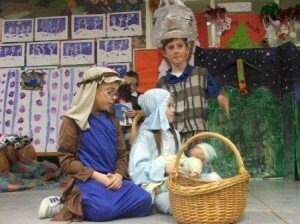 How about these Nativity Plays?….. Acted by a young child, the donkey can add a cute factor, or more of a comedic effect acted with attitude by an older child. The story is told with lots of gentle humour and short speaking parts, all held together with a rhyming narration and interspersed with 6 simple songs, for which sheet music and bonus mp3 backing tracks are included. Sound suitable for you? Still prefer The Simplest Nativity Play Ever?